Rich culture, traditional architecture and stunning natural landscape makes Asia a truly magnificent place to cycle. The diverse history attached to each country ensure's no two experiences will ever be the same. From the inspiring Angkor Wat in Cambodia to the winding tea trails in India, all of our Asian holidays provide you with a unique cycling experience. Exploring Asia on two wheels is the best way to get off the beaten track, to become immersed in the different countries history and observe the rich, often traditional, lifestyles that the locals live. If you choose to follow one of our guided holidays in Asia, you will be shown the famous sites as well as the regions hidden secrets, meeting incredible people with fascinating stories along the way. Calming Japanese waters merging into the expansive forests. A side of Japan often overlooked in western culture. With so many unique cultures in Asia, there’s something for all family members regardless of age or cycling ability. The Chiang Mai Family Cycling Holiday in Thailand is a particularly popular trip for families due to the constant exposure to incredible wildlife, imperious mountains and the chance to meet some many interesting, kind locals. Children love the excitement of the area whilst parents appreciate the true natural beauty of Thailand’s rural landscape and the stunning temples dispersed around the region. The Angkor Wat Family Cycling Holiday is also popular with families, visiting the 8th Wonder of the World and a famous UNESCO World Heritage Site. The best holiday in Thailand, for those looking to cut costs, is the Central Thailand Cycling Holiday. From just £520 you'll be introduced to the true culture of Thailand and become immersed in the country's rich lifestyle, visiting the River of Kings and experiencing the hustle and bustle that surrounds the canals. When travelling to Asia, you'll want to ensure you have the most memorable experience possible. An often once in a lifetime experience, these truly fulfilling holiday's will leave you wishing you never have to return. Seasoned riders are always looking for new challenges. Cycling in Asia is the best way to combine a unique, awe inspiring environment with challenging, rewarding cycling. 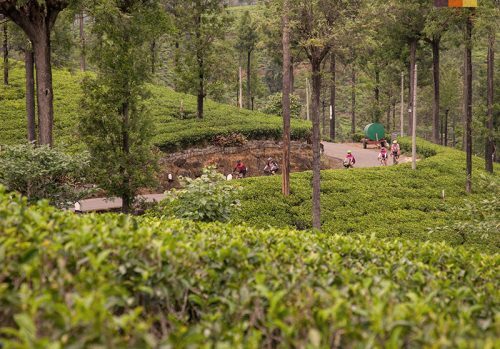 In Sri Lanka, rolling hills weave in and out of the vibrant countryside and expansive rice paddies, providing you with an average of 95km of riding a day with an average climb of 840m on our Road Cycling Holiday. These climbs take you up stunning mountains where you’re rewarded with breathtaking views of the region. In East Asia, theres options to do similar, culutrally explosive rides. The Hoi An to Siem Reap Cycling Holiday in East Asia offers similar distances and climbing in a dramatically contrasting but equally beautiful region. Whilst cycling in Europe provides you with great views of the Alps or the chance to ride in the footsteps of Tour legends, climbing mountains in Asia, in particular Japan, is an experience unlike any other and one that you'll never forget. On day 4 of the Kyushu Onsen to Onsen Cycling Holiday, you'll begin your ascent of Mount Futaga, climbing 1175m and riding 57km. Whilst you may find tougher rides in Europe, you're unlikely to climb a mountain in the world that provides you with 11th century wooden temples, authentic coastal villages and traditional local lifestyles along the way. This ride, along the Kunisaki Peninsula, is a true bucket list experience and, therefore, gets our vote for the best climb in Asia. Riding with friends is very popular in Asia. The guided trips, in particular, allow groups of friends to enjoy the stunning landscape and heritage whilst meeting other similar riders and learning more about the area via a knowledgeable, friendly guide. Our Siagon to Siem Reap Cycling Holiday is one of many trips perfect for groups of friends, the 9 day ride takes you through the highlights of Vietnam and Cambodia and offers some of the best cycling in Asia along pristine roads that, in themselves, encompass a significant part of the two country’s rich but turbulent history. Myanmar, an often overlooked country in East Asia but by far one of the most interesting and beautiful. The ride from Inle to Bagan, from east to west, will offer an authentic Asian experience. Before the trip even begins you'll get to watch life go by on Inle Lake. As stilt houses float on the beautiful waters, the locals go about their everyday lives. An old-fashioned way of life but a rich and rewarding one. As you head off on your cycling holiday through Myanmar, you will become immersed in a country that's still relatively new to tourism and, therefore, the most traditional you're likely to find anywhere in Asia. Each day the sunsets will get better, as will the scenery, wildlife and riding. Whilst we love all of our Asian cycling holidays, this is certainly one of the best. Photo opportunities will come think and fast on your trip to Asia and a full, action packed schedule should be expected. From the stunning Noto Peninsula in Japan to the one of the 8 wonders of the world, Angkor Wat, in Cambodia, there will be multiple spots on every holiday in Asia to take some incredible pictures that will stay with you for a lifetime. The recent turbulent history of Vietnam makes the country a fascinating place to explore via bike and, with many scarred monuments still standing, you will be taking pictures at every stop so as not to forget the significance of the area’s you stayed. Why Travel to Asia with Love Velo? Travelling to Asia can often be daunting. With a language barrier and, often, it being a first time trip, its understandable that you may decide against travelling due to the complications that would be involved. As a result, we make it a priority of ours to ensure your trip is hassle free and you can enjoy the experience without having to worry about logistics, timings or transfers. With accommodation, meals, airport transfers, guiding, bike hire and baggage transfers all included, your Asian holiday will be fully inclusive. We've ridden the majority of our these holidays and loved every minute of them. With great contacts in each country, trusted hotels at the end of each day, experienced transfer and hire companies and a great knowledge of the routes, you can be assured that your cycling holiday in Asia will be truly unforgettable.